We did this walk on Sunday 19th September 2010. 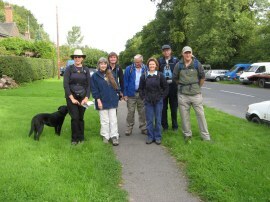 For the first time for some time we had an almost full turnout of walkers with eight of us setting of from Holmbury St Mary, photo 1. 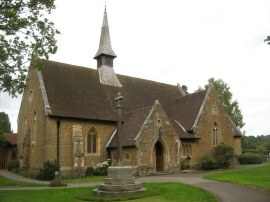 From our parking spot on the Horsham Road we headed up Pitland Street and into Holmbury Hill Road. 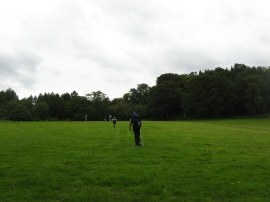 Being busy catching up with each other we all missed the Greensand Way heading off to the right on a track which leads up to the very attractively appointed Holmbury St Mary cricket club, photo 2. Fortunately Anne soon realised we had headed too far up the road and after retracing our steps for a while we were soon back on course. 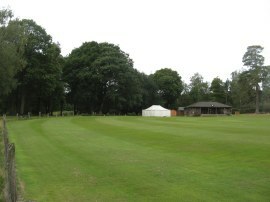 From the road the route heads steadily uphill along the track, bending round to the left to reach the cricket ground before continuing along through the trees of Hurtwood, photo 3. 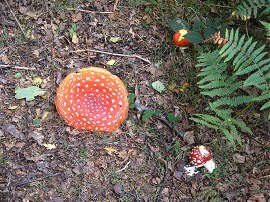 Under the trees where large numbers of Fly Agaric toadstools, photo 4, a toadstool that is always associated with Birch trees which are very common within Hurtwood. 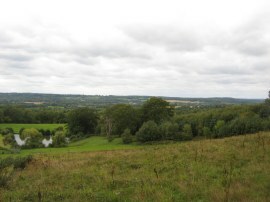 The Greensand Way follows a path that runs through the woodland, close to the southern edge of the Greensand Ridge which is well defined in the area. 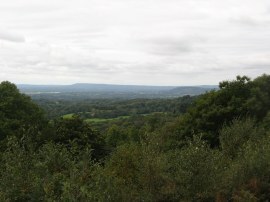 Every so often the path would leave the trees at a viewpoint from where there were good views across the surrounding countryside, both over the Weald towards the South Downs which could clearly been seen stretched out along the horizon and along the Greensand Ridge towards the west, photo 5. Reaching the top of Holmbury Hill, at 261 mtrs the highest part of the days walk, there was a large stone cairn and an information board listing all the places that could be seen. 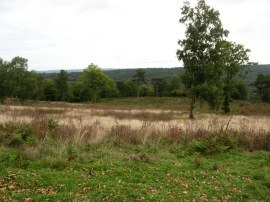 Also located close to the summit was the site of Holmbury Hill Iron Age Fort, photo 6. From Holmbury Hill the route heads through the trees to a car park and crosses over the Radnor Road. Here the route joins a track that soon branches left, heading down hill through the trees to reach the first bit of open ground of this stage as the route joins a footpath that heads over a number of fields, photo 7, to reach the Ewhurst Road. Here we headed more or less straight across the road and up the driveway to the Duke of Kent School. Leaving the driveway the route joins a path that heads steeply uphill through trees, crossing a minor track before reaching a more level path close to the top of the ridge, photo 8. Here we headed to our left along a broad path running through the trees, photo 9, as we approached the 257 mtr high summit of Pitch Hill. 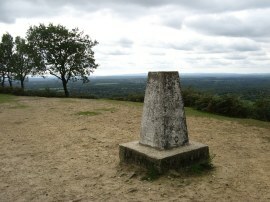 The views from Pitch Hill were very similar to those that we had had from Holmbury Hill earlier in the walk although the open space at the top of the hill also had a trig point, photo 10, where Anne enjoyed listening to Dave explain all about the joys of trig point bagging. From Pitch Hill the route heads back through the trees to reach another road, Ride Way, which the Greensand Way crosses before continuing ahead, once again heading quite steeply uphill for a short distance, before the path levels out. The path through the trees soon reaches a driveway which leads down to a road junction. The route heads across this and down another road for a few yards before joining a footpath on the left which heads through the trees at Reynards Hill where we paused for another short break at a viewpoint. The path then gradually curves round to reach a road. At first the path runs alongside the road before joining the tarmac for a short distance as the route passes across the top of Jelleys Hollow, a deep gulley heading downhill from the ridge. 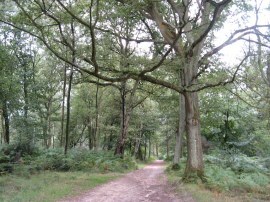 The path then headed back into the trees on the left to pass along the edge of Winterfold Hill. As with much of the walk so far it was very pleasant walking along the sandy paths through predominately birch woods, occasionally interspersed with other trees. 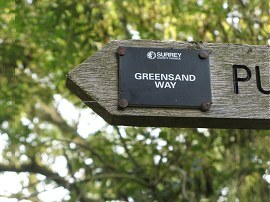 There were Greensand Way signposts in most places and navigation was generally quite easy although there were the odd times when we needed to check the map to ensure we stayed on course. Crossing another minor road the route joins a track from where unfortunately there had been a large number of white good fly tipped down the side of the hill. This path heads downhill to eventually leave the woodland, close to Willinghurst Farm, where we stopped for lunch, enjoying the views over the surrounding countryside, photo 11. From our lunch spot we headed downhill, passing alongside a large pond and between a few small paddocks to reach a driveway which leads to Stroud Lane. Here we continued ahead for a short distance before joining a footpath on the left that runs between fields and gardens to soon join another driveway. At the end of this the route heads left along a well kept gravel path, and then left again, along a footpath that runs down between fields to reach the B2128 at Shamley Green besides Christs Church, photo 12. 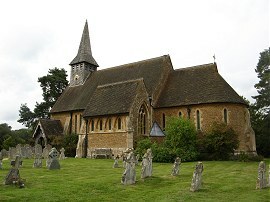 From the church the route crosses the road and heads past the rectory to join a footpath running between fields, photo 13. The path then heads between a couple of houses and alongside some smaller fields, where the path crosses the River Wey, to once again join a farm track. This track crosses over an old railway bridge, the old track bed below now forming part of both the Wey-South and Downs Link recreational paths. 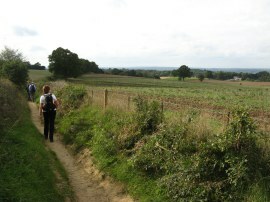 Running above, the Greensand Way follows the farm track through Rooks Hill farm to reach the A281. Here the route heads to the left for a short distance before joining a path on the other side of the road. On one side of the road the broad verge had been planted with a mixture of sunflowers and a wide range of very colourful small in between which made a very attractive display although the photo I took didn't come out well enough to add here. Between the river and old rail line the route had also crossed over the course of the Wey and Arun Junction Canal although not being aware of this at the time I didn't stop to see if I could see any trace of it. Leaving the main road the route heads along a footpath that runs between fields and a Christmas Tree plantation to Brookwell Lane. Heading to the left the route makes its way round to Gatestreet Farm. 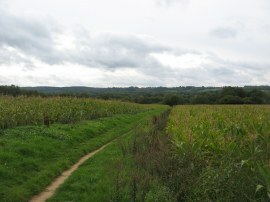 Just before the farm building are reached the route heads to the right, following a field edge path round to the left alongside some woodland. The path briefly joins a track before heading across another short field and into some trees, photo 14, the route heading downhill and past a lake at Wintershill where there was a very strange and incongruous bright white igloo type structure. Looking on the internet the Wintershall Estate is the home of the theatrical productions of The Life of Christ, The Acts of the Apostles and The Wintershall Nativity play though exactly how the "igloo" fits in I don't know!. Continuing ahead the route heads up to another field where there was a stage type structure before joining a path that runs just inside some woods. Leaving the trees the route heads down to reach a road by Scotsland farm where we headed to the right for a short distance before joining a track on the left that headed into an area of pine trees, photo 15. 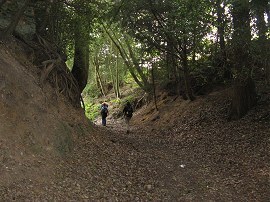 The route heads through the trees along a sandy track before reaching a more open area on the left where the route joins a track on the right that heads downhill along a very deep sunken lane, photo 16, towards the village of Hascombe. 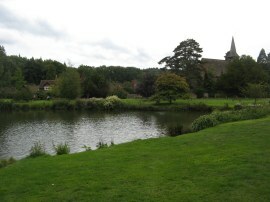 Reaching the village, the Greensand Way continues ahead along Church Lane, passing an attractive village pond, photo 17, and St Peters Church, photo 18. 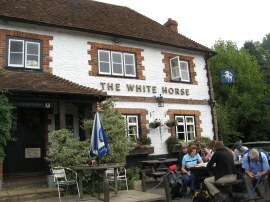 Reaching the White Horse pub, photo 19, at the junction with the B2130, we stopped for a quick drink before crossing the road and heading over a couple fields into another area of trees. For a while the path headed quite steeply uphill along a sunken track before joining a more level path on the left. This takes a fairly straight course through the various plantations of The Hurtwood before heading down to Markwick Lane. 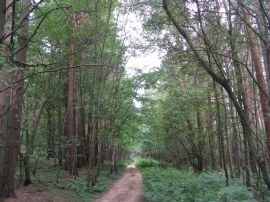 Here the route heads to the left before joining a footpath on the right that heads through another area of trees. 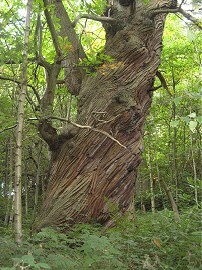 Amongst these trees were some enormous sweet chestnut trees, photo 20, with twisted and gnarled trunks, considerably larger than any I have ever seen before. 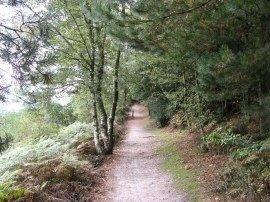 For a while the path runs alongside the edge of the trees with a field to the left as the Greensand Way heads towards Vann Hill. 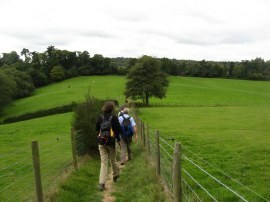 Here the route briefly joins a road before taking a footpath on the left that runs between fields, photo 22, towards the village of Hambledon and our parking place besides Hambledon Church. 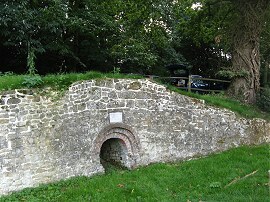 Close to the small car park were the remains of an old lime kiln, photo 23, where the walk ended for the day. Reaching the car my GPS said we had walked 14.3 miles, which apart from the slight detour near the start had all been along the Greensand Way. It was nice to meet up with everybody again and I do enjoy walking through the sandy woodlands of the Greensand Ridge that characterised much of this stage. 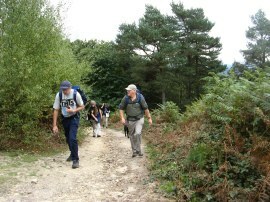 As usual I have uploaded the route of the walk which can be accessed here: Greensand Way 7 Route.